In June, Edsel Records will issue “Brick – The Songs Of Ben Folds 1995–2012”, a huge 13CD box set that takes a detailed look at the output of American singer-songwriter Ben Folds. It includes all four Ben Folds Five albums (including 2012’s comeback album, The Sound of the Life of the Mind), all of Folds’ solo albums (up until 2012), live recordings, b-sides and other bonus material. In this new set the first album (1995’s Ben Folds Five) comes with five bonus tracks, while the second (Whatever and Ever Amen from ’97) features 19 extra tracks on a separate CD. The third album from the original era – The Unauthorised Biography of Reinhold Messner – also includes a two extra songs and a radio edit. Ben’s first solo album, Rockin’ The Suburbs was issued in 2001 and is included here across two discs (with 14 bonus tracks) and 2005’s Songs For Silverman only includes a couple of bonus cuts, but this is because most of the extra material from this era can be found on disc nine of this set Songs For Goldfish (at the time bundled with Songs For Silverman and sold via Folds’ website). Supersunnyspeedgraphic compiles song from a trio of EPs – Sunny 16, Speed Graphic and Super D – and Folds’ final solo album Way To Normal is present and correct in both standard and Stems and Seeds variant (the latter sees the album re-ordered and remastered with much less compression). 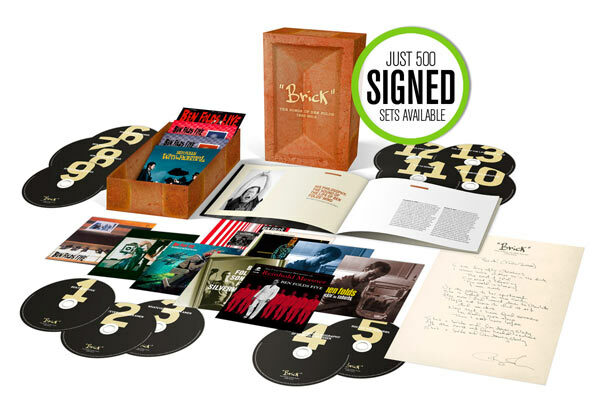 Brick – The Songs Of Ben Folds 1995–2012 includes a 60 page booklet featuring a brand new interview with Paul Myers and comes in unique ‘brick’ packaging.